Julia Louis-Dreyfus: Don't Just Vote, Volunteer [VIDEO] - Joe.My.God. 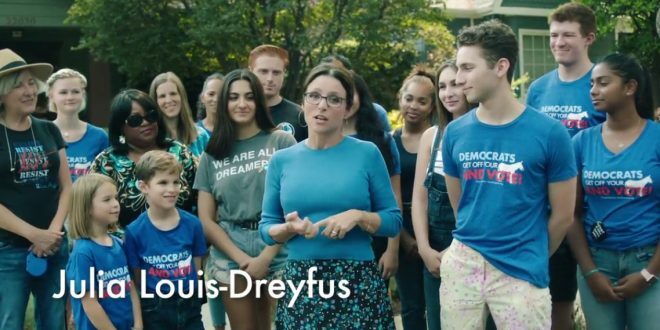 Julia Louis-Dreyfus has a message for American citizens ahead of the upcoming midterm election: Don’t just vote — volunteer. PEOPLE can exclusively announce that the actress, who has long been an outspoken Democrat, has partnered with registered Federal PAC Local Majority to put together a PSA — directed by her husband Brad Hall — aimed at getting out the vote. The campaign encourages people to visit MultiplyYourVote.org, where they can find where and when they can volunteer to help win back Congress in November. JoAnn Loulan from the grassroots organization behind the campaign, Local Majority, said was inspired to start the organization after the 2016 election.